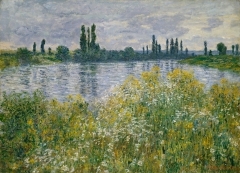 In 1883 Monet moved his household, his two sons along with Alice Hoschedé and her children, to the rural community of Giverny, where he leased a house that he was able to purchase seven years later. 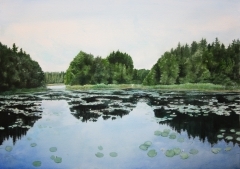 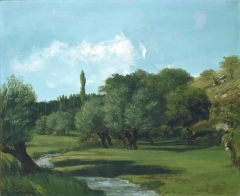 In early 1893, he acquired a swampy area across the railroad tracks abutting his property and petitioned the village council for permission to divert a small stream into it. 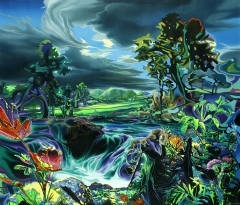 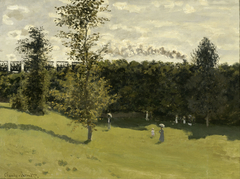 But it was only toward the end of that decade that he turned to the garden he had created there as a rich source of artistic inspiration. 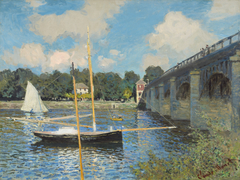 In 1899, Monet painted 12 works from a single vantage point, focusing on the arching blue–green bridge and the microcosm of his water garden. 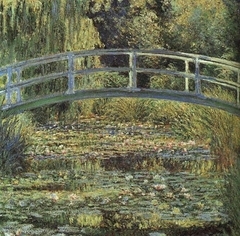 Among the 12 works was the National Gallery's Japanese Footbridge. 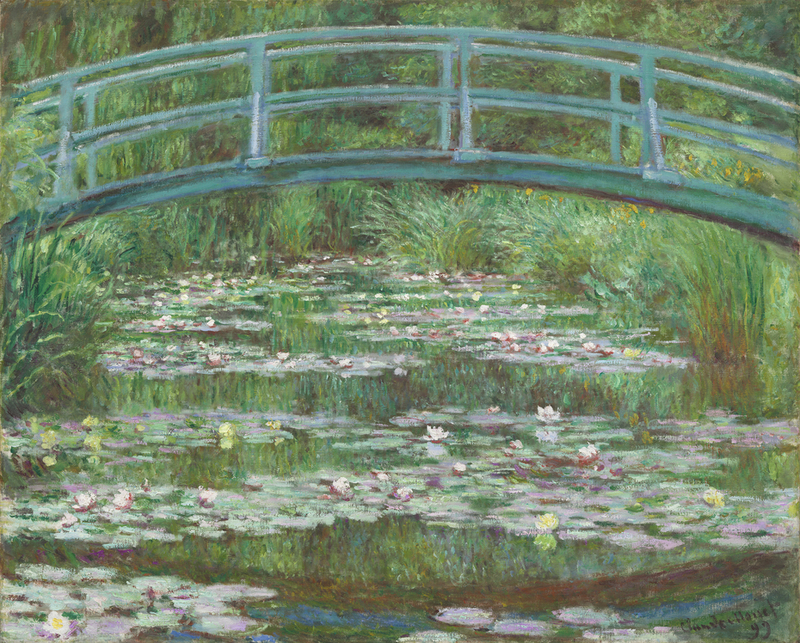 Monet designed and built the landscape that appears in the painting—from the bridge to the pond and its shape, to the water lilies and other plantings. 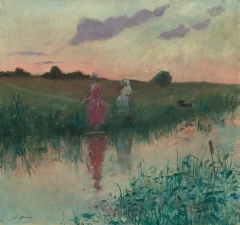 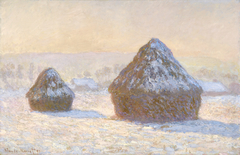 The artist, who as a leader of the impressionists had espoused the spontaneity of directly observed works that capture the fleeting effects of light and color, had in these later paintings subjected a nature he re–created to sustained, meditated scrutiny. 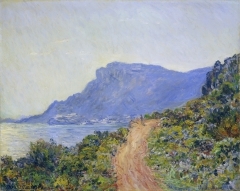 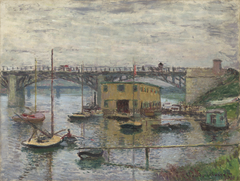 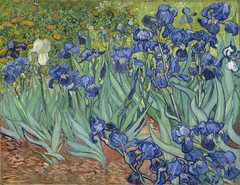 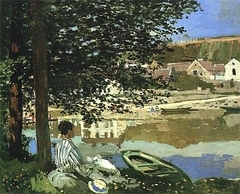 When Monet exhibited these paintings at Durand–Ruel's gallery in 1890, a number of critics mentioned his debt to Japanese art. 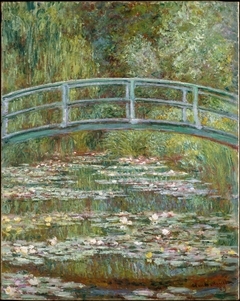 More telling, the impenetrable green enclosure—heightened in the National Gallery painting by the placement of the top of the bridge's arch just below the painting's top edge—harkens back to the hortus conclusus (closed garden) of medieval images, while also evoking a dreamlike contemplative zone consonant with symbolist literature, especially poems such as "Le Nénuphar blanc" by Stéphane Mallarmé. 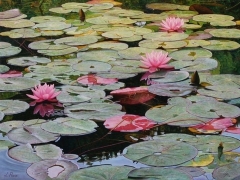 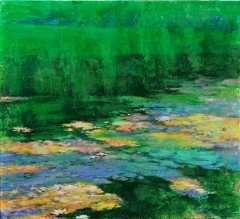 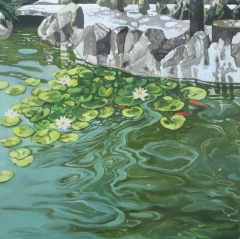 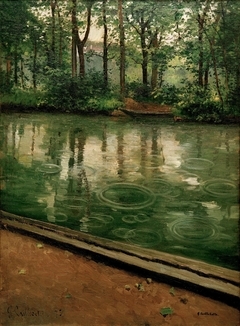 Gustave Geffroy described this effect in his review of the exhibition (Le Journal, November 26, 1900), speaking of "this minuscule pool where some mysterious corollas blossom," and "a calm pool, immobile, rigid, and deep like a mirror, upon which white water lilies blossom forth, a pool surrounded by soft and hanging greenery which reflects itself in it."